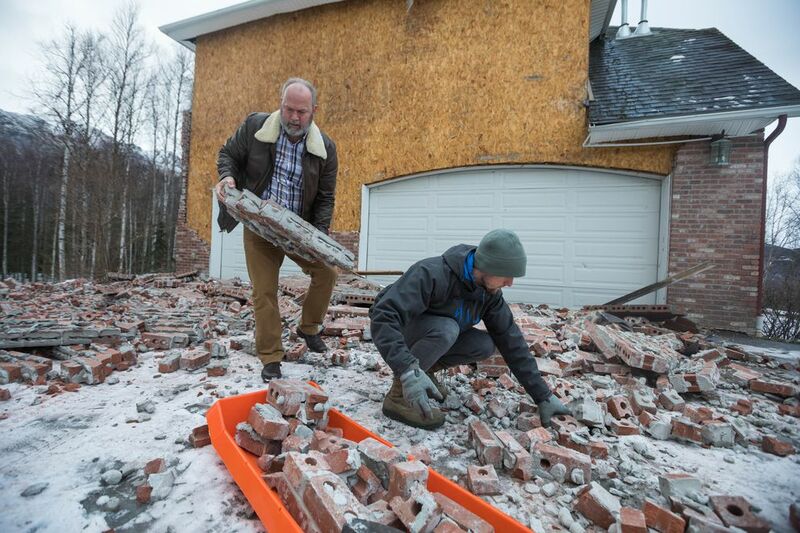 At Steve and Alicia Baker’s house in Eagle River, one of the places hit hardest by Friday’s 7.0 earthquake, the walls cracked, bricks fell off the facade outside, bookcases toppled, a claw-foot tub shifted several feel and pulverized heirlooms littered the floors. But by Saturday, the rooms were full of people helping clean up. Similar scenes played out across Southcentral Alaska the day after the most damaging earthquake to hit the Anchorage area since 1964. Many residents lost sleep to aftershocks. By afternoon, winds kicked up, howling outside newly boarded windows. The Glenn Highway was damaged in multiple places, the Seward Highway was under threat of landslides, the water was not yet officially declared safe to drink and the reports of serious damage to roads, bridges, homes and businesses kept coming. 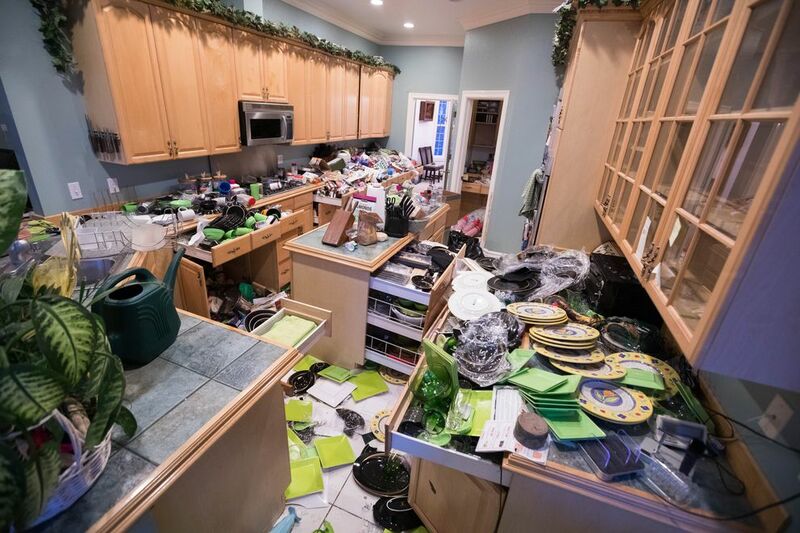 Even so, people in Alaska’s largest city swept up, replaced broken housewares, helped neighbors and tried to calm nerves. On Saturday, Dawn Gold wheeled a new television out of Walmart with her two granddaughters, Rilynn, 6, and Maya, 2. Her other TV tumbled and broke. Nobody slept Friday night because of the aftershocks, she said. At bedtime, she and Rilynn watched a movie on the internet about how earthquakes work, she said. “I was just mainly concerned that my kids and my grandkids were safe,” she said. When Scott Merriner, a pastor at ChangePoint Church, arrived Friday to check on his congregation’s building off of Raspberry Road, the sprinkler heads had been shaken loose, causing the water to rise inside to knee-height. 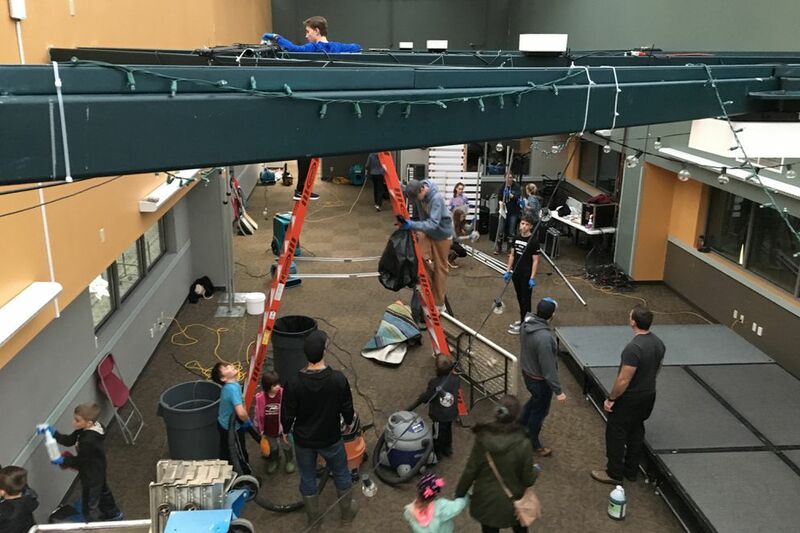 However, most of the damage was cleaned up within just a few hours, thanks to about 100 volunteers who showed up Saturday morning to help shop-vacuum and redecorate. Sunday services are still on, Merriner said. One of those volunteers, ChangePoint member Marian Katt, was busy wiping down a flood-damaged wall in the front atrium. “I’ve been on the receiving end of kindness, and I’ve been on the giving end,” Katt said. At Anchorage’s Central Transfer Station off the Old Seward Highway, people were dropping off trash bound for the landfill. The transfer station is usually closed on Sundays but will be open at the 56th Avenue entrance on Dec. 2 in light of the earthquake. That site and the Anchorage landfill will be open from 8 a.m. to 5 p.m. Sunday, and possibly later based on the level of demand. 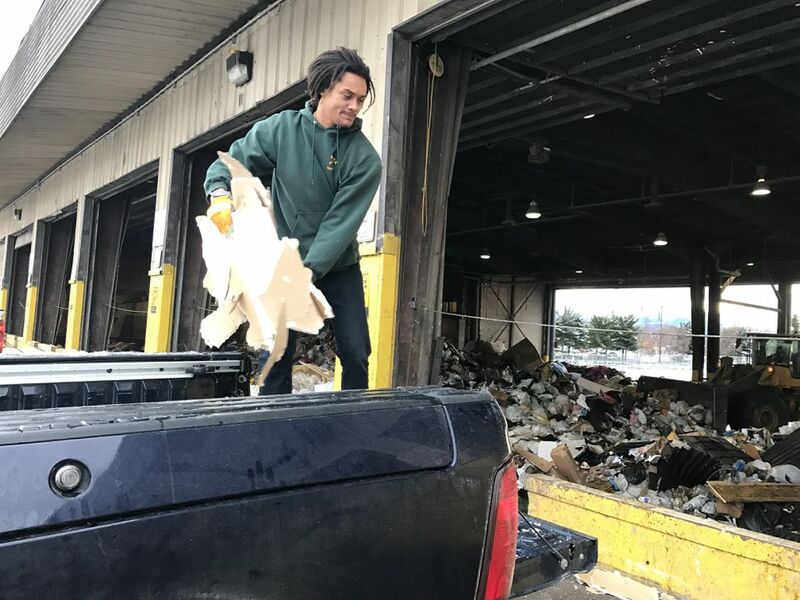 Dylan Nolder stood in the bed of a pickup truck, chucking pieces of broken drywall into the massive pile of garbage. The ceiling in his basement collapsed, he said, and a pipe burst. He had just closed on the house — in the area of Jewel Lake Road and Raspberry Road — three weeks ago, he said. Nolder was born and raised here and he’s never been afraid of earthquakes, he said. But Friday’s was different. Now, he plans to keep earthquake supplies in his truck, just in case something happens in the future. In the aftermath of the quake, Anchorage Museum staff members were balancing cleanup efforts with the job of cataloging the “ephemera of the moment,” as museum director Julie Decker put it. That involves tracking earthquake memes spreading across social media, and other items that might say something about Friday’s temblor. Some ceiling panels came down in the older part of the museum, but there was very little damage to artwork and artifacts, Decker said. There’s dust and water to be cleared away and artwork that must be cleaned. And with 60,000 items to tend to, Decker said that will take months. “We will go through with literally a toothbrush and a fine-tooth comb” to make sure everything is in top condition, she said. Christ Hawkins, operations manager for Servpro, a company that does disaster recovery, was at Walmart buying cases of water for his crew. 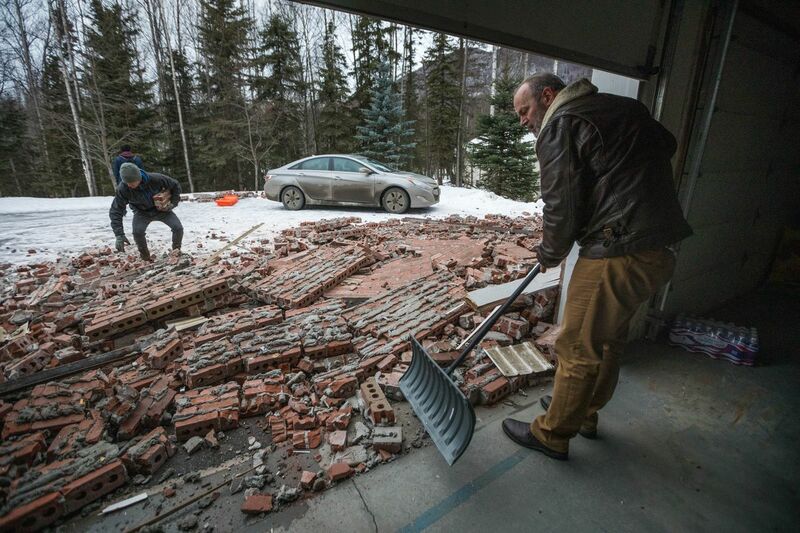 His house in Eagle River was “a compete disaster,” he said. He was relatively prepared for a disaster with water and food, but nothing prepares you for seeing your house full of broken glass. The shaking was so hard it separated his deck from the rest of building. When he was driving home, before he saw any of the damage, he had a moment of calm, he said. The traffic was slow, people were losing patience and driving on the shoulder. “We all have family and we’re all going to the same place,” he said. " You got to take a deep breath and kind of go with the flow." Amy Shimek owns Metro Cooks, a housewares store where the shelves are full of dishes and glasses. She opened the back door to the store Friday morning with trepidation. The store was littered with broken ceramics and glass and the ceiling tiles were hanging. This is her busy season and every shopping day counts. A small army — her stepdad, her mother, two cousins, an uncle, a couple lifelong friends, employees and their families — showed up to help put the store back together, she said. She estimates she lost $20,000 in merchandise. She’s not an emotional person, she said, but when she talked about the clean-up effort, her eyes welled. At Garcia’s restaurant in Eagle River, about a dozen workers and friends worked around large floor fans as the business tried to recover from water damage suffered when a pipe burst. Owners Jason Hemphill, Ronn Laurin and Joel Rivas spent all day Friday trying to push water out the door of the popular Mexican restaurant on Business Boulevard. “This place looked like a war zone,” Hemphill said. The owners said the carpet will likely have to be replaced, but said that once the water is turned back on the restaurant should be able to open again relatively quickly. “No one got hurt, that’s the main thing,” he said.